During dental implant surgery, a missing tooth is replaced with a titanium post that is surgically inserted into the jaw bone. There, it replicates the natural root and fuses with the jawbone until it is strong enough to support the crown, bridges, or dentures. Once everything is correctly fused, a custom made tooth also called crown will then go onto the post. From there, you will be able to eat, smile, and talk normally. 3. What is One-Stage Surgery? Follow-up & Aftercare – What is the Success Rate? Getting a proper and thorough assessment before you get surgery is critical to see if you are a good candidate for implants. You will need to take various tests to plan everything accordingly and make sure that you get the best possible implants and that nothing goes wrong. There may be some risks but with proper planning, those potential problems can be mostly avoided. Click here to read a more detailed description of implant complications. Your surgeon will go through your medical history very thoroughly. You should tell him about any medications you are taking, as they can impact your surgery and/or healing process. A standard examination of your mouth, gums, and jaw bone will be required to test for any other dental health problems that will need to be treated before the implants are placed. This will allow you to get approval so that the surgery can be planned and executed to the best standards. Once you have passed through the initial assessment, you will need to get an x-ray and CT scan of your mouth to fine tune the assessment. (remember they will add up to the cost of implants) The dentist may also take “before” photos of your teeth or dental impressions. These tests will help your dentist plan the surgery depending on things like your sinus cavities, nerves, and blood vessels. Of course, it will all depend on your jawbone and bone density. Don’t panic if a bone graft is needed, as that is quite common with this procedure. Many times it will have to be done before the surgery but sometimes it can be done during. Before surgery, your dentist will use a custom made surgical guide from the impressions and the other tests. It is used during to help guide the drill to pinpoint the exact location he/she needs to be for the best fit. This process has to be accurate so that they can make the most of your bone and to avoid nerves, or sensitive spots. Dental implants are usually placed by a dentist or surgeon while the patient is under local anesthetic. If you are extremely nervous, you can ask to use nitrous oxide (laughing gas) or intravenous sedation. Your dentist or surgeon will discuss these with you, but in most cases they prefer the patient be awake. First Stage: The implant post is inserted into your jawbone during surgery. A small incision is made through your gums in order to expose the bone. The surgical guide is positioned in the mouth to help your dentist drill into your jawbone exactly where the implant is planned to be placed. Gently, he or she will widen the hole until it is the right size for the implant. Then, the implant is simply screwed into place. Finally, the gum tissue is folded back over top of the implant and held together with a few stitches. The gum tissue is there to help protect the area from any pressure and it also allows for osseointegration – allowing the implant to integrate with the rest of your mouth. New bone cells will grow around and fuse the implant to your bone. Once that happens, you can move on to the second stage. During this stage, one of the risks include something called bone burn, which damages the surrounding bone as well as the sinus cavities and nearby nerves, that’s why perfect planning and experience are very important. 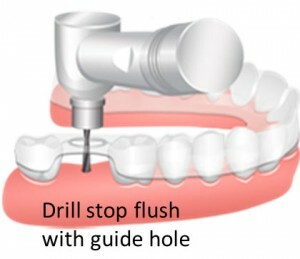 Second Stage: Once everything is integrated, your surgeon will cut your gums to expose the top of the post. He or she will then check to make sure everything looks in working form before attaching the abutment. The abutment is used to connect the final restoration (crown, bridge, dentures) as well as support it. Depending on your case, the abutment will come standard or will be custom molded. Your gum tissue will need time to heal while the final piece of the puzzle (the restoration) is being produced. After your gums are healed, you will get impressions taken of your mouth. These will be used to create your new tooth or set of teeth. These can be removable or fixed, depending on your situation. Once that is ready, the fixed prosthesis will be secured into place with a screw or cement and cannot be removed by anyone but a trained professional. As a side note: please note you will also find some dentist call this method the 3 step procedure as they consider the crown placement as another step while others don’t. Anyway, whatever it is called, you know what it is about. If your dentist doesn’t choose that procedure, he or she may choose to attach the abutment during the same procedure where the post is inserted. However, you will still need to allow time for osseointegration – which means you will have to be careful when biting or chewing. To help with this, you might be fitted with a temporary tooth that will allow for a dispersion of pressure. One-stage surgery typically uses a one-piece dental implant (a post combined with an abutment) that doesn’t require a second procedure that will expose the implant, or will place the post and attach the abutment immediately. In fact there are many different types of implants and each dentist has his or her preferred methods but the main idea is that the implant sticks out from the gum tissue. So you won’t need to get your gum tissue cut again. You usually will get a temporary healing cap on the post. This cap protects the one piece dental implant. Once everything is integrated, the cap is easily removed, then the replacement tooth can be attached. Please note this is often also called immediate load implants or one day implants. It is key that after surgery, you follow the instructions. Eat foods that are soft and don’t require a lot of chewing for a few days. You might want to avoid foods that can get stuck in your teeth as well. Then you can start building up to harder foods as things feel comfortable for you. Good oral hygiene will help the healing because the surgery site must remain clean and infection free. Your dentist may prescribe you medicated mouthwash, which you should use. Discomfort can occur, but it should be minimal and easily helped with OTC painkillers. All of your swelling should be gone within the first 5 days and the pain should be completely gone after 10. It can take anywhere between three and six months for your posts to completely integrate and reach full strength and then another two for the crown to be made. This timeframe is not a one size fits all plan and you should talk to your doctor to learn more about your own timeline. Dental implant surgery is one of the most successful dental surgeries with success rates between 95% and 97%, but to make your implant suregry as suceesful as possible, make sure topick the right dentist. Check here our article with tips to find a good one. • Practice excellent oral hygiene – keep everything clean so that you don’t have any bacteria. Plaque and food debris are bad signs when it comes to your teeth. You may want to buy special water picks to help you clean the area. Not keeping on top of your oral care will almost ensure a failure. • Keep going to the dentist – you want to see your dentist every 6 months or so for cleanings, check ups, and general care. This can prevent any other problems or even save you from having to do this again. Monitor any abnormal pain that could occur during your healing time. • Avoid bad habits like chewing on ice, hard candy, or other substances that shouldn’t in your mouth. Remember where your implants are and make smart chewing decisions. Surgery, no matter what kind or where it is, involves risk. Dental implants are no exception to that rule, but the problems associated with this surgery are rare and minor.